Hubble Frontier Fields view of Abell 2744. Credit: NASA, ESA, and J. Lotz, M. Mountain, A. Koekemoer, and the HFF Team (STScI). (Phys.org)—Astronomers have found a total of 76 new ultra-diffuse galaxies (UDGs) in the massive galaxy cluster designated Abell 2744 (also known as Pandora's Cluster). The discovery updates the current census of galaxies in this cluster and could help better understand the nature of UDGs in general. The findings were presented in a paper published Dec. 30 on arXiv.org. UDGs are extremely-low-density galaxies. The largest UDGs have sizes similar the Milky Way but have only about one percent as many stars as our home galaxy. The mystery of UDGs is still baffling scientists as they try explain why these faint but large galaxies are not ripped apart by the tidal field of their host clusters. Furthermore, it is not clear what fraction of UDGs are "failed" giant luminous galaxies, "inflated dwarfs," or some other phenomenon. Abell 2744 is a giant galaxy cluster located nearly 4 billion light years away in the Sculptor constellation. It is one of the most massive and most disturbed galaxy clusters known to date. Its intracluster light fraction is high and its stellar population consistent with the disruption of luminous galaxies, which makes it an excellent location to search for UDGs. That is why a team of researchers led by Steven Janssens of the University of Toronto, Canada, has investigated Abell 2744 using data obtained with the Hubble Space Telescope (HST) Frontier Fields (FF) program. FF is known for producing the deepest images to date of galaxy clusters and gravitational lensing. The analysis of FF data allowed the astronomers to distinguish dozens of new UDGs in this giant galaxy cluster. "We report the discovery of a large population of ultra-diffuse galaxies in the massive galaxy cluster Abell 2744 (z= 0.308) as observed by the Hubble Frontier Fields program," the researchers wrote in the paper. As a result, the team detected 76 new UDGs—41 in the cluster field and 35 in the parallel field. They also estimated the total number of UDGs that Abell 2744 contains. 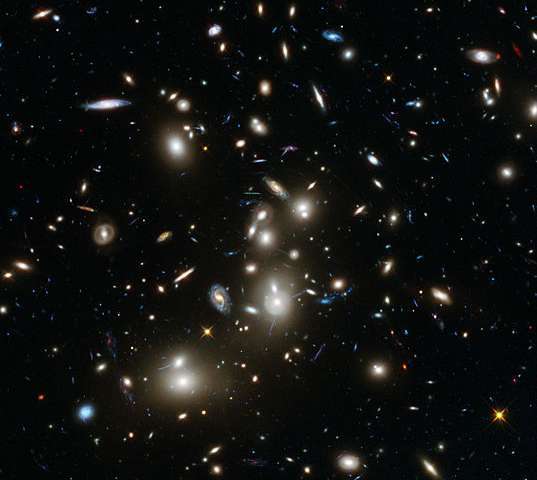 According to the paper, given the fact that the analyzed data from the observations samples only a small portion of the galaxy cluster, there should be approximately 2,100 ultra-diffuse galaxies in Abell 2744. The researchers noted that this is 10 times the number of UDGs that exist in a similar cluster known as Abell 1656 (or Coma Cluster). "Abell 2744 hosts an estimated 2133±613 UDGs, 10 times the number in Coma," the paper reads. The research also allowed the scientists to estimate the number of ultra-compact dwarf (UCD) galaxies in Abell 2744. According to their calculations, there are about 385 UCDs in the galaxy cluster. The researchers concluded that some UCDs in Abell 2744 may have once been nuclei or satellites of infalling UDGs, noting that the latter are ultimately destroyed by tidal forces. "As UDGs fall in and dissolve (and, presumably, blend into the intra-cluster light), they leave behind a residue of unbound, but long-lived UCDs," the team wrote. We report the discovery of a large population of Ultra-diffuse Galaxies (UDGs) in the massive galaxy cluster Abell 2744 (z=0.308) as observed by the Hubble Frontier Fields program. Since this cluster is ~5 times more massive than Coma, our observations allow us to extend 0.7 dex beyond the high-mass end of the relationship between UDG abundance and cluster mass reported by van der Burg et al. 2016. Using the same selection criteria as van der Burg et al. 2016, A2744 hosts an estimated 2133 +/- 613 UDGs, ten times the number in Coma. As noted by Lee & Jang 2016, A2744 contains numerous unresolved compact objects, which those authors identified predominantly as globular clusters. However, these objects have luminosities that are more consistent with ultra-compact dwarf (UCD) galaxies. The abundances of both UCDs and UDGs scale with cluster mass as a power law with a similar exponent, although UDGs and UCDs have very different radial distributions within the cluster. The radial surface density distribution of UCDs rises sharply toward the cluster centre, while the surface density distribution of the UDG population is essentially flat. Together, these observations hint at a picture where some UCDs in A2744 may have once been associated with infalling UDGs. As UDGs fall in and dissolve, they leave behind a residue of unbound ultra-compact dwarfs. This is not good news for DM Enthusiasts. The narrative that the galaxies within this cluster exhibit abnormal rates of velocity within the cluster due to Inferred Gravity influence of Dark Matter comes under more intense scrutiny than ever before. All these new visible matter galaxies & their gravitational influences within the cluster acting to displace the Inferred Gravity Narratives of DM is bound to get DM Enthusiasts disjointed. I know DMEs, you'll be here concocting unscientific stories why this changes nothing, all the usual untested & unobserved narratives about why Inferred Science should preclude all this TESTED & OBSERVED Data. Wrong again. UDGs appear to have the highest DM content of all galaxy types. See e.g. Large numbers can therefore only ADD to our estimates of DM content. Wrong again. UDGs appear to have the highest DM content of all galaxy types. ......and a Journalist checks in with his Inferred DM pseudo-science. Yep, you had come up with something just as I predicted, something that exonerates Zwicky from further appearance(s) of his incompetent OBSERVATIONS as well as UNTESTABLE hypothesis. The march of INFERRED PSEUDOSCIENCE narratives by the scientific illiterate crowd moves ever onward from within your world of Journalism. By the way Rguy, while expending so much effort locating irrelevant links, find a link to somebody who has claimed to have a test tube of this stuff so I can do a Spectroscopy of it in our test lab, this way I can come here & publish my analyses on the Spectrograph confirming the validity of the nefarious claims of all this Inferred Pseudo-science you're so in love with. Above, I provided high quality references for my claims from AUTHORITATIVE sources (unless you think the Palomar Observatory, one of the most prestigious in the US, are a "scientific illiterate crowd"). Where are the references for YOUR claims? The rest of your post is pure gibberish. BTW. Where did you get the idea that I am a journalist? Unsurprisingly, this is ANOTHER unfounded and false claim on your part. Got my observatories briefly confused. Should have said Keck. RNP please don't confuse Benni with the facts, it makes him all loopy. Your "high quality references" from AUTHORITATIVE sources are simply your handpicked sources who can't supply the Scientific method of submitting a spectrograph. Where are the references for YOUR claims? that the rest of your post is pure gibberish. Where did you get the idea that I am a journalist? Unsurprisingly, this is ANOTHER unfounded and false claim on your part. I looked it up at another site, it's called data mining. So you are saying the Keck Observatory is staffed by people who "can't supply the Scientific method"? Do you have any evidence for this slanderous claim? I bet not! Then you have now also registered an epic fail in data mining. I am not, nor ever have been, a journalist. FOOL! So, there is an inverse relationship between how much DM is in any region of space vs. how much baryonic matter is in the same region? No. How did you arrive at that conclusion? UDGs are just an extreme case. The mystery of UDGs is still baffling scientists as they try explain why these faint but large galaxies are not ripped apart by the tidal field of their host clusters. Because the influence of gravity is in fact limited, maybe to around 10 KLyrs. Why should it be unlimited in distance? Because the math fairies said so?? .......it was Keck who did not supply the Spectroscopy, it is not up to me to supplement what they were unwilling to do. Every one of those newly discovered galaxies reveals REAL GRAVITY sources, not the INFERRED GRAVITY sources you & the TinFoil Hat(ty) crowd like to fantasize about at your Trekkie Conventions. ........you are a journalist, it's evident in the sophisticated forensic algorithms I thought I'd have some fun running. No wonder you're so easily dupped into living with the TinFoil Hat(ty) crowd here, you believe in Perpetual Motion & you don't even know it, that's how badly dupped you are Phys 1. Yes I did. I have Benni on ignore but most of the time there is enough quoted in responses to see his feeble attempt at being correct with no understanding of evidence or of the scientific method. While I am at it thanks for the links that you provide to many of the source documents. Hatty, please, don't take yourself so seriously, it only adds to the entertainment value those of you in the TinFoil Hat crowd provide. I enjoy the amusement of Perpetual Motion that acolytes like you & Phys1 bring to a science site. But tell me, are you one of those who looks in a mirror & wishes 80-95% you were missing or are you one of the those who wonders what your missing parts looks like? ... who can't supply the Scientific method of submitting a spectrograph. I'm not even a DM enthusiast, but that's ridiculous. Exactly what part of 'dark' in 'dark matter' did you fail to understand, Benni? What we know is that many galaxies and galaxy clusters BEHAVE as if they had more mass in them than we can see, OR gravity behaves differently from what is commonly accepted, OR some other force is acting like extra mass or gravity, OR something is wrong with out observations, etc. Dark Matter is an explanation that hypothesizes that it is extra mass that we cannot see. The most common explanation is that it is matter that does not interact with light. So if you are trying to knock the standard explanation of Dark Matter, even you should be able to figure out that a spectrograph is useless for something that doesn't interact with light. Asking for a spectrograph of something wouldn't interact with light is BEYOND stupid. I already pointed out to you that even those who are certain that the anomaly is caused by unseen matter don't think that it is distributed the same as matter and that 80-95% of a person is dark matter. You tried to claim otherwise and it turned out that you were misinterpreting a poorly-written claim by journalist. So you repeating that over and over again is beyond stupid as well. Think, Benni. If dark matter detectable only through its mass existed, made up 80% of mass, and were distributed exactly the same as regular matter, then we would simply that regular mater had five times the mass and we wouldn't even have a mystery. Even you can figure that out! So unless your goal in life is just to be annoying, please at least find an argument that isn't moronic. Your "sophisticated forensic algorithms" are clearly a joke, just like everything else you present here. Or perhaps you are just inventing them, just like you have with your status as a "Nuclear engineer". Whatever the case, just as I no longer comment on your ridiculous assertion that I am Phys1, I am not going to bother with this one either. Even you can figure that out! Agree with everything you say, but that one? No. I don't think he could ever figure that out. Not with a million years of tutorials. Asking for a spectrograph of something (Dark Matter) wouldn't interact with light is BEYOND stupid. What is BEYOND stupid is your abysmal lack of the textual content of Einstein's General Relativity in which he proved GRAVITY bends starlight by 1.75 arcsecs as it passes the immediate peripheral disc of the sun. In Special Relativity Einstein proved the MASS/ ENERGY EQUIVALENCE PRINCIPLE, meaning Mass & Energy behave in EXACTLY the same manner within any field of gravity, & this is REAL SCIENCE. Your biggest claim to the existence of DM are the fields of GRAVITY creating GRAVITATIONAL LENSING & counter GRAVITATIONAL ENVELOPES around Spiral galaxies preventing the radial arms from imploding into the central hub. So, DM doesn't "interact with light" is the new narrative? Before you continue coming here making BEYOND stupid statements about what you claim to know about what "spectrographs" can reveal, or that DM does not have discernible interaction effects with Energy(light), you need to learn what REAL SCIENCE is & get out of the cycle of Perpetual Motion that you fantasize to be reality. You made a mistake fundamental to the proven thesis of the Einstein Field Equations of gravitational interaction between ENERGY & GRAVITY. So knock it off with the name calling & profanity & find a different life on some TinFoil Hat social media outlet rather than trying to compete with me on my turf as a science professional who spent six years in Engineering school majoring in Nuclear/Electrical Engineering. Say what? I already told you I'm not a Dark Matter Enthusiast - I gave equal billing to multiple possibilities, only one of which was dark matter. So why is it suddenly MY claim to the existence of DM? So, DM doesn't "interact with light" is the new narrative? I should have been more specific. The hypothesized DARK matter would not interact with light in any way where SPECTROSCOPY would be useful. Einstein's General Relativity in which he proved GRAVITY bends starlight by 1.75 arcsecs as it passes the immediate peripheral disc of the sun. According to Einstein's interpretation of GR, even gravitational lensing would not be DM interacting with light - it would be the mass of Dark Matter BENDING SPACE while the light continues in a straight line. So why again were you asking for spectroscopy for dark matter? As for name calling, I agree - that should not be done in this comments section; I never start it and usually try to stamp it out, but occasionally late at night I respond in kind to someone's comments. Since you started it, it is hypocritical for you to complain. But rather than stooping to your level, I should just simply point out that using "the absence of Spectroscopy" to challenge the existence of something for which spectroscopy would be irrelevant is, hmmm, I can't think any way to describe it that you wouldn't find insulting! So let's repeat this in polite language. Why would you expect spectroscopy to reveal anything about matter that wouldn't interact with the electromagnetic force? .....Some excuse for a totally backwards & screwed up statement that I called you out on. Have you ever spent even so much as a few hours of time actually studying the texts of Special or General Relativity? And I'm not referring to something you read about somebody else's opinion about the texts. Your cobbled & disconnected semantics is evidence against your proficiency in science, yet you imagine you can lecture me about how SPECTROSCOPY is generated, or beyond that, what can't be generated by SPECTROSCOPY, this is 50% of what I do professionally. ......because it's observational EVIDENCE of the EXISTENCE of MASS anywhere in the Universe! You are so miseducated in the tenets of Special & General Relativity that you completely fail to understand this. Have you ever spent even so much as a few hours of time actually studying the texts of Special or General Relativity? You have the gall to suggest someone else does not understand Relativity when you have only recently proven that you have NO understanding yourself ("Mass is not energy": https://phys.org/...est.html ). There is no doubt RealScience understands it much better than you. Now you are an expert in spectroscopy! That's a new one. So, give us your expert advise on how one would go about getting the "spectroscopic" evidence for OR AGAINST dark matter. Be aware that if you can not provide an explanation of HOW such evidence could be obtained, then RealScience is right (embarrassing if you are the expert you claim to be, neh). ... statement that I called you out on. Which is why I also pointed out that even as written my statement was correct, just not precise. Are you denying that Einstein modeled the effect of gravity as a warping of space? Yes, I took a entire course on GR. Do you want to bet on which of us has more degrees in physics? what can't be generated by SPECTROSCOPY, this is 50% of what I do professionally. So then explain how matter that didn't interact with electromagnetic fields would be detected through spectroscopy. ......because it's observational EVIDENCE of the EXISTENCE of MASS anywhere in the Universe! While spectroscopy can detect SOME matter, it does not detect mass that does not interact with EM fields (neutrinos, for example). .....however the beta decay process from which neutrinos are released comes from Visible Mass which has associated spectroscopy, for example our Sun, the source of most neutrinos we detect here on earth. Hey, you got some particles of DM we can do this kind of detection on? It shouldn't be hard to come up with some according to the numbers of DM Enthusiasts. Don't you realize Einstein calculated gravitational lensing of photons passing the immediate peripheral disc of the Sun without the necessity of adding a constant to correct for 80-95% Missing Mass? And he did this within 0.02% of error at 1.75 arcsecs. So, you claim to have multiple degrees in Physics & know so much about Energy & Gravity, maybe you could identify the section in GR in which he did this computation? If it is your intent to prove your claims that a specific type of MASS exists, then the onus is yours to come up with the spectroscopy, then YOU will have your evidence..........Journalists like you shouldn't be asking questions like these, you innately frame the questions backwards without even knowing it. Those who hypothesize that DM is neutrinos think that the neutrinos are primordial rather than stellar, and that ALL matter is merely a left-over from a slight asymmetry in the process that created the neutrinos (and the same for axions). So by that theory ANY spectrum you measure IS from matter ASSOCIATED with DM. There you go again acting as if DM theories say that 80-95% of the sun would be dark matter. You have yet to provide a link to ANY theory that says this. And if DM were EVERYWHERE, it would have been included in the mass Einstein used for the sun because the mass he used for the sun was calculated from the sun's gravitational effects. So your argument fails EITHER way. Hey, I actually ALMOST agree with you - IF I WERE trying to prove that DM exists the onus would indeed be on me to provide evidence (spectroscopy or other evidence). Except that it is NOT my intent to prove that DM exists. This thread started with YOU, Benni, making the claim that DM enthusiasts are "incompetent" and "scientific illiterate", so the onus is on YOU to provide the evidence to back up your claim. And what was your "evidence"? a spectrograph is useless for something that doesn't interact with light. .........I don't have an argument, you do. You claim the existence of something for which you have no EVIDENCE, then you try to pass it off your lack thereof as if I should disprove what you have no evidence for. it would have been included in the mass Einstein used for the sun because the mass he used for the sun was calculated from the sun's gravitational effects. .......and not just our Sun but any other object for which gravitational lensing has ever been calculated. Aside from our Sun, do you know of any object anywhere in the Universe that a constant was inserted into Einstein Field Equation calculations to account for gravity generated by Missing Mass in performing Photon Deflection calculations? Where have I have claimed that dark matter exists? I am not even a dark matter fan. I've seen many new particles discovered, so I would much rather have a new understanding of gravity or a new force or a new understanding of light discovered than yet another particle. And there are several alternate theories that agree with the observational evidence with fewer tweaky parameters ... but are less-well explained. I keep an open mind to DM or not DM, and hope that the answer is clear within my lifetime. In contrast you claim that dark matter does NOT exist, so the onus is on you to at least supply a decent argument. What I have done is show that some of your arguments that DM does not exist (80-95% of you is missing, and now spectroscopy) do not apply to the mainstream DM theory that you are ridiculing. So find new arguments rather than repeating those already shown to be irrelevant. Exactly. If dark matter were distributed the same as regular matter (down to the subatomic), all our calculations would work out the same because we would simply think that matter had more mass. So I've never seen any scientist claim that DM has he same distribution as regular matter. do you know of any object anywhere in the Universe that a constant was inserted into Einstein Field Equation calculations to account for gravity generated by Missing Mass in performing Photon Deflection calculations? DM enthusiasts assume that it is missing mass rather than a missing constant. I think that until a DM particle is found, claiming that it is definitively some new form of matter is not warranted, especially given the amount of effort that has gone into looking. But none of the alternatives is solid yet either, so I'll keep an open mind. Benni, it has been explained to you many times. DM is a placeholder label. No one knows (or claims to know) whether it's a massive particle, a non-uniform gravitational constant or whatever else. Investigations are ongoing in all directions. Some groups are looking for the signatures of massive particle - because that is the easiest thing to do with the technology we have. But even they aren't claiming that DM *must* be a massive particle. For some other theories we don't even know how to go about testing them. That doesn't mean they are being disregarded. It just means they'll have to wait until someone figures out an experimental setup. There is no such thing as a 'DM enthusiast' the way you imagine (i.e. someone who thinks DM *must* be a massive particle). That's just something you conjured up yourself by erroneously latching onto the *matter* part of the label in DM. Just like black holes aren't necessarily black (or holes) DM isn't necessarily matter. There is no such thing as a 'DM enthusiast' the way you imagine (i.e. someone who thinks DM *must* be a massive particle). I wouldn't go quite that far, AA. I would agree that MOST leading-edge scientist use "Dark Mater" as a place holder for "whatever the heck it is that causes the effects that we see". But there are quite a few other scientists who are convinced that it is a particle of some sort and who dismiss MOND and other dark-matter alternatives, and those would qualify as Benni's Dark Matter Enthusiasts. At least they write as if it must be some form of missing mass, and I use that as a proxy for what they think. In any case, whether it is a new particle, a new sector of particles, a new force, a new understanding of gravity, a new understanding of our observations, a peek at new dimensions or at new universes, if/when we figure it out we will have learned something interesting! From the papers I've read I don't get that. Just because someone is writing about that they are investigating certain energy ranges for massive particles (e.g. excluding some with their experiments) or calculating mass distributions doesn't mean that they are hooked on the idea that it *must* be massive particles. They're just trying to follow up all the leads. And each scientist group can only follow up one lead at a time. "Dark Mater" as a place holder for "whatever the heck it is that causes the effects that we see"
Oh, you mean INFERRED GRAVITY? Have you paused for even a brief moment to ponder the portent of what it means to INFER something? This is a reasoning process not arrived at from explicit TESTABILITY or OBSERVATION. Look out when people come to conclusions by the reasoning process the Pope & his Court of Cardinals used on Galileo, they were out to execute him. There are myriads of people in the social networking world of Pop-Science Culture who believe GRAVITATIONAL LENSING does not occur except in the PRESENCE of DM. They believe this garbage because when they go to astronomy websites, they are inundated with pics of galaxies that have been airbrushed with purple smudges all over them & informed that the Einstein Ring Lensing effects they observe at the bulge of the galaxy is the result of the presence of those smudges they inserted. ..........the Tooth Fairy exists, prove I'm wrong. Don't you realize Einstein calculated gravitational lensing of photons passing the immediate peripheral disc of the Sun without the necessity of adding a constant to correct for 80-95% Missing Mass? And he did this within 0.02% of error at 1.75 arcsecs. Bennington could it possibly be that Mr. Einstein calculated the correct amount of deflection simply by an equation accounting for two known objects? Yeah, the Visible Mass of the Sun & the mass of the photon, that seems to add up to "two known objects", although you'll probably want to quibble about whether or not a photon is an object or whether it has MASS. Just so you know, when Einstein did the calculation he deleted the MASS of a photon from his calculation because it was so trivial that it had little effect in the outcome of the measurement, that was part of the 0.02% error. ..."whatever the heck it is that causes the effects that we see"
The first of these effect seen was stars in spiral galaxies appearing to orbit the galactic center faster than the gravity from the observable matter of those galaxies would hold them together. One possibility is extra gravitational force, which could be from us not understanding gravity, or from extra mass that had not been observed. Some extra mass was found in neutral hydrogen clouds, etc. but nowhere near enough to account for the faster rotation, so harder-to-detect mass was theorized by many, with WIMPS and MACHOS being the leading candidates. Or it could be some other force. But what? (queue EU enthusiasts...). There is a vast difference between a decent argument and proof. The evidence for the tooth fairy is the money under the pillow and the tooth being gone. Other possible explanations include parents. The parents have money, are generous to the kid, took an interest in the truth, and were already caught making up stories about the Easter bunny. I have personally talked to numerous parents that admit to having exchanged money for a tooth and told the kid that it was the tooth fairy, so I have a decent argument that the tooth fairy is very likely mostly parents. And you can check the argument for yourself by asking parents. It is not PROOF that the tooth fairy doesn't exist, but if you had as good an argument as that on DM, a lot of people would at least listen. Yeah, which could be labeled the Zany Zwicky Effect, Envelopes of Dark Matter Halos surrounding only Spiral Galaxies creating counter-gravity attraction on the radilal arms whereby preventing them from imploding into the central hub.........there RealGuy, I just explained it better than you did, and you claim to have multiple degrees in Physics. The biggest obstacle to the Spiral Galaxy DM Halo theory are the actual observations of massive VM Halos located exactly where Zwicky predicted DM Halos would be found. The VM Halo of the Andromeda Galaxy has Spectroscopic measurements that extend more than half the distance to the Milky Way & vice versa. I guess you don't know about this do you? Well then RealGuy...........Is it a "decent argument" to hypothesize against VAST halos of counter-gravity DM halos in the precise locations where Zwicky predicted we'd find huge envelopes of his cosmic fairy dust, and instead SPECTROSCOPY DATA proves only VM exists at those locations? Ok, I get it, if DM does not interact with ANYTHING, therefore it can't be proven that the VM & DM halos can not exist alongside one another, is that it? If you want VM & DM halos existing existing alongside one another, then the gravitational attraction on the hypothesized maginitude of a 5:1 ratio of DM to VM means DM gravity would drastically distort the OBSERVED VM Halo out of the pattern in which it is presently OBSERVED as MEASURED by SPECTROSCOPY. I'd suggest you go to a good science site & learn something about how SPECTROSCOPY works in analyzing Interstellar & Intergalactic data, it isn't what you think. Hi there Phys1, I see Physorg has dropped your account, so you're using one of your many other handles to get in a worthless opinion with your 1 Star. ... stars in spiral galaxies appearing to orbit the galactic center faster than the gravity from the observed matter of those galaxies would hold them together. No, the apparent anomalous rotation of galaxies would be the "Verifiable Vera [Rubin] Effect". The "Zwicky Effect" would be the apparent anomalous movement of galaxies within clusters. Are you arguing with the EFFECTS themselves? Or are you arguing with DM as an EXPLANTION of those effects? And if you are arguing against DM as an explanation, are you arguing against all unobserved matter, or just against undiscovered exotic particles? Great - an actual argument! So far as I have seen, the VM halos still are far short of the mass needed, but I agree that it is a start. Now link the best paper and get a real discussion going! ......PROVE IT. First you need to know how much DM exists in those ENVELOPES & you can't know that if you have a SPECTROSCOPY of VM ONLY. Provide EVIDENCE that DM Halos exist alongside VM Halos at the 5:1 ratio of DM to VM. You got something that compares the density of one to the other? Ok, I get it, if DM does not interact with ANYTHING, therefore it can't be proven that the VM & DM halos can not exist alongside one another, is that it? The VM halos FOUND SO FAR are a good start - if enough additional VM is found to account for the anomalies (e.g., if astronomers find 5x that much additional VM halo), exotic-particle DM halo theories will lose >90% of their adherents (a few diehards would still insist). That's actually the possible explanation that was in vogue when I last took an astronomy course - astronomers were looking for gas clouds, dead stars, failed stars, etc. And they are still looking, and still finding, but so far it is nowhere near enough - the gap is big enough feed the more exotic theories. When enough missing VM is found to account for the missing mass, please post a link! In the mean time I'll keep an open mind. ......PROVE IT. First you need to know how much DM exists in those ENVELOPES & you can't know that if you don't have a SPECTROSCOPY of VM ONLY. Again, YOU are the one making the CLAIM so You are the one who needs to provide evidence. I'm also skeptical of enough normal matter being found. I'm also skeptical of gravity deviating that much from 1/r^2. I'm also skeptical of the observations being wrong. I'm skeptical of novel forces. I'm skeptical the solution is not on this list. Since I haven't seen conclusive evidence for anything, I keep an open mind. It is the explanations that are "zany". So, Lenni, pick an m and an r, and work out n and R₂₂. It's not very hard if you actually know how to work DEs. @RealScience, this approach has been tried before. I've tried it myself. Lenni just goes off into lala land. Its latest claim to be a "nuclear engineer" is merely the most recent in a long string of claims to knowledge it does not possess. My "repellent" is a reminder that it has claimed to be able to solve differential equations yet seems incapable of actually doing so when presented with them. ...you claim to have multiple degrees in Physics. There you go again incorrectly saying that I have made some specific claim. I replied that I took an entire course on it (a claim). Since you mentioned competing and your education, I then ASKED if you wanted to BET on who had more degrees in physics. That is not a claim – it is a question. I could have multiple degrees, one degree or even no degrees and be bluffing. But I AM offering to bet, and for $10,000 it would be worth finding a trusted third party to hold the bet (and being 'outed' on phys.org). So do you want to bet $10K on which of us has more degrees in Physics? Are you still imagining that Radial Arms failing to implode into the central hubs of their associated Spiral galaxies constitutes "anomalies"? First you need to prove the INFERRED anomaly exists. Everything about this whole cosmic fairy dust theorem focuses on cascading INFERRENCES. One so-called ANOMALY that INFERS yet another, which in turn INFERS another, in turn INFERRING yet another..,,,,.practically ad infinitum. What the hell kind of science is that? It's TinFoil Hat Pop-Sci culture stuff born right out of the depths of Schneibo's Perpetual Motion Math that he's still trying to push. Lenni deploys another variation of the black cat in a dark room fallacy: claiming there's nothing there because one cannot see it, when its purr and the click of its claws on the floor are clearly audible. Not to mention the sensation when it brushes against one's ankles. Yeah, I usually ignore Benni. But when I'm doing paperwork I need an outlet for aggression; JVK is no longer around, and after a late night of year-end paperwork I read some phys-org and Benni just happened to repeat an argument that I'd already debunked. Arguing against what a theory says is fine, but arguing against something that no theory says is just a waste of pixels. Heh, being self-aware is one of the common characteristics of the intelligent. The one that I look at first (because it is the closest to home) is Spiral galaxies appearing to rotate significantly faster than the known matter in them would hold them together if gravity is always 1/r^2. ... stars in spiral galaxies appearing to orbit the galactic center faster than the gravity from the observable matter of those galaxies would hold them together. So please send a link showing that enough VM halo has been found to hold spiral galaxies together at the speeds they appear to rotate. Yes, but the purrs and clicks of claws could be a dark cat in the room, a tiger about to leap through the window, the 'animal planet' channel on the TV, or problems with our hearing, etc. We should not assume that it MUST be a cat until we find it, especially if we have started searching the neighborhood for cats and haven't found any yet. The problem with Benni is not that he doubts invisible matter, but that he is SURE that it is not invisible matter (and apparently SURE that it is visible matter). Astronomers have also looked for extra normal matter, and while they have doubled the amount known, they have looked really hard and are still missing ~5x. Sure, but it might also be a black dog. The point is, there's something there, whether we can see it or not. Denying there's something there is ignoring reality. And claiming people are incompetent and hearing things is as well. And as you say, it still might be a black cat. ......You bet Schneibo, and I'm still awaiting the pictures of Black Holes you claim to have seen. Are you ready to share them yet? Post us a link.........? ... The point is, there's something there, whether we can see it or not. Denying there's something there is ignoring reality. Based on Benni's comments in this thread, he's not denying that there is something there, he's saying that it is normal 'visible matter' that we haven't yet seen or haven't properly accounted for. And that might be - it is what most astronomers I know started with as a default assumption (but that was decades ago). Even Zwicky used 'dark matter' in contrast to 'luminous matter'. Weird forms of matter only became a dominant theory came up when a search for normal matter only made up ~2x of the ~10x difference. Not just claiming that people are incompetent, but then also misrepresenting what those people say to set up a straw-man to attack instead of actually arguing against what people/theories do say. The problem with Benni is not that he doubts invisible matter, but that he is SURE that it is not invisible matter (and apparently SURE that it is visible matter). ...hey Unreal.....it is your burden of Proof, that there is not enough VM Halo extending beyond the visible periphery of any galaxy for which you claim the Inferred presence of vast fields of gravity. Because I comprehend the portent of the recent Spectroscopy of intergalactic VM halos, the burden of a ~5x. is squarely on you. Astronomers have also looked for extra normal matter, and while they have doubled the amount known, they have looked really hard and are still missing ~5x. If these Astronomers had been actually been about the business of actually studying Spectrographs of intergalactic VM Halo, they would have recognized the peril the "still missing ~5x" is in. Or they think the 5x still missing ratio exists because they have refused to give up a bias over a sacred fantasy. ........you are a journalist, it's evident in the sophisticated forensic algorithms I thought I'd have some fun running. are you attempting to uncover illegal data mining, illegal astrophysics or establish that some specific data is considerably factually incorrect due to some historical application of blatantly wrong or illegal methodology? are you considering litigation of the scientific peer review process? Um, no, the burden of proof is on the person who is SURE of the answer (YOU), especially if that person ridicules people who favor different answers. So find a link to that shows that the known visible matter is sufficient to account for the rotation velocities of starts in spiral galaxies. Riiiight - they didn't yet find what you say they should, so they aren't actually looking. They are looking, Benni - a Nobel prize awaits for anyone who finds that much extra mass. Go look yourself, since you are an expert in spectroscopy. Go show them how it is done, and then claim your Nobel prize! .....however, you're the one who denies any possibility that Spectroscopy of VM intergalactic halos do not detract from the INFERRED MASS of DM or the INFERRED GRAVITY associated with DM. It's a common problem with DENIERS to form backward arguments, as you are doing. For sure we know you aren't "looking", we know this because you have stated that your "5x still missing" position hasn't changed & you haven't even yet studied the Spectrographs. Now you have me suspecting you don't know how to read a Spectroscopy. You don't do you? They don't need me, they've been on the job of it for 2-3 years now & yours is the response to belittle those doing so. WHERE do I deny that that is a possibility? Far from it - I point out that the amount of 'normal' matter known has already roughly doubled, I explicitly acknowledge finding enough additional VM to account for the anomalies as a possibility. ... & yours is the response to belittle those doing so. It was YOU who said "If these Astronomers had been actually been about the business of actually studying Spectrographs of intergalactic VM Halo..."
One READS a spectrum, a spectrograph or a spectroscope. .....on the losing end of so many "arguments", now you resort to whimsically construct subtleties of the manner in which the word "spectroscopy" is used semantically. I have consistently used the word as a noun, as a branch of Science. ......you however want to change the use of the word to that of an uncommonly used form of a VERB, it is most commonly used as a NOUN, look it up. When I have used the word "spectrograph", I have been careful to use it within the context as the reproduction of he original frame of measurement, the medium of storage. So, dismal attempt on your part trying to cast dispersions on my professional credentials. As for you, the best I've seen is unimpressive with your level of comprehension of anything to do with Nuclear Physics or any such related material. on the losing end of so many "arguments"
You've made claims and failed to provide evidence for them when challenged. You've alleged that I've made claims, and failed to show that I made those claims. And you have failed to overcome any of my arguments. Readers of this thread can judge for themselves who lost. Your use of 'spectrograph' has been fine. Do you have a link showing that enough VM has been found yet to account for the spiral galaxy rotational velocity?